Volkswagen has announced prices for the new Jetta with the entry-level S 1.4-litre TSI 122bhp model starting at a competitive £16,960 'on the road'. The top of the range Jetta, the 2.0-litre TDI with DSG costs £22,320. All new Jettas are fitted with air conditioning, an MP3 compatible CD stereo, six airbags, ABS, Electronic Stabilisation Programme (ESP), an alarm and folding rear seats. Compared to the car it replaces, the new Jetta is 90mm longer at 4644mm with a wheelbase increase of 70mm to 2648 mm. This allows the rear legroom to increase by 67 mm, while the interior has been improved too with a more upmarket look and feel. To help give the Jetta a stronger identity, none of its panels are shared with any other Volkswagen. Powering the Jetta is a range of efficient and refined TSI petrol and TDI diesel engines. Two petrol engines are offered - joining the 1.4-litre TSI 122bhp entry-level engine is a range-topping twincharged 1.4-litre TSI unit developing 160bhp. The diesel range starts with a highly efficient 1.6-litre TDI engine developing 105bhp. Equipped with BlueMotion Technology, features including Start/Stop and battery regeneration are standard and it's capable of achieving a claimed 67.3mpg on the combined cycle while emitting just 109g/km of CO2. A 2.0-litre TDI engine developing 140bhp is also available. Still frugal, it returns 58.9mpg combined and has a CO2 figure of 126g/km. 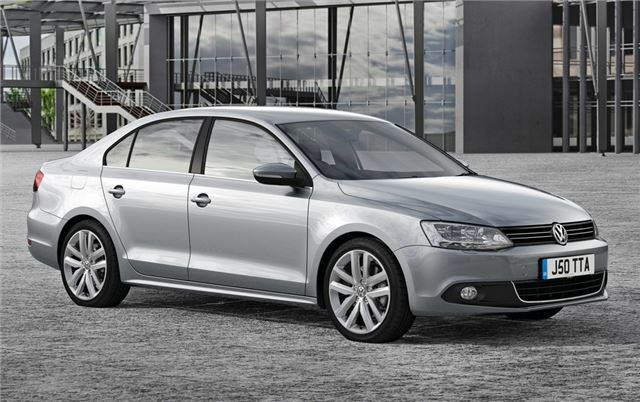 The 1.6-litre TDI and the 1.4-litre TSI 160 PS unit can be specified with the option of a seven-speed DSG gearbox. The 2.0-litre TDI is available with a six-speed DSG transmission. The Jetta is available to order now, with first customer deliveries due in May.